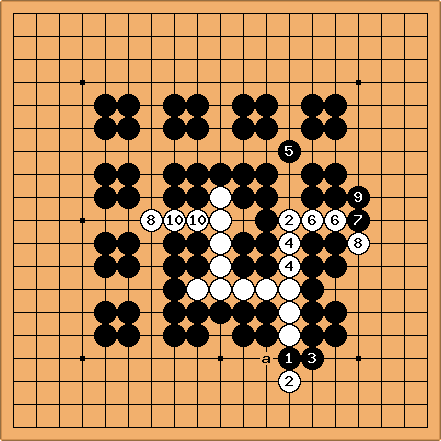 Even if Black starts, Snowwhite can escape to one of the marked points. 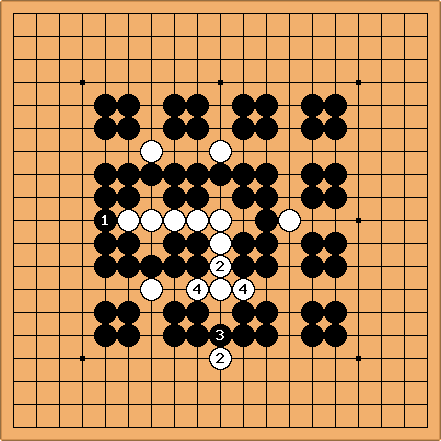 Black is off to a good start with , but is a clever response making miai. Black 3 blocks one way, but just heads for the opposite direction. is forced and White makes miai again with . Rest of sequence is forced. Well, apart from the fact that I think black would be better off starting on one of the points where is in the diagram, you appear to be right. 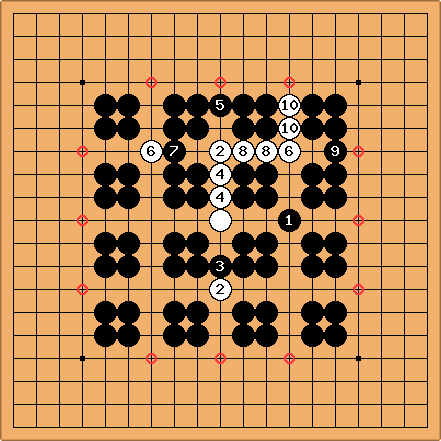 White can play (or a+c or b+c etc.). tderz: if Black blocks at the inside, White gets a ponnuki. and a are not equivalent. Black a might be safer. What is the real continuation? 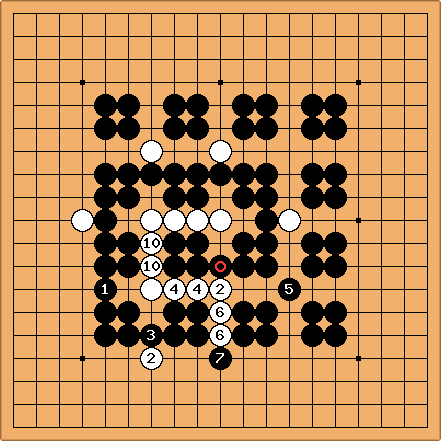 2 years ago, I posed this problem as a miai exercise for our beginners in the club up to 15 kyu at that time. 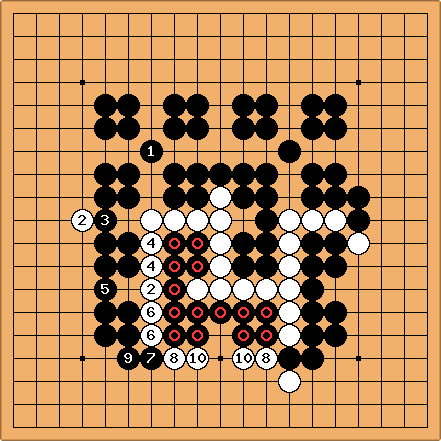 I created a PDF which I hope to link somewhat later here, and remember that White has to be careful!. This doubling of moves - say a super-nobi was not equal to the strategy where white constantly makes miai of the mirror symmetry points, i.e. constantly spreads in different directions (e.g. 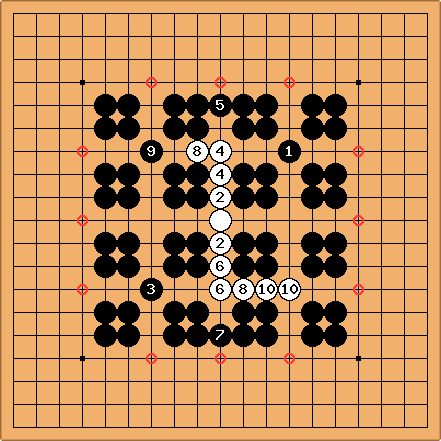 in dia (6) above) and puts her stones on the junctions between the bamboos (i.e. the here and , in diagram (1) but not , , , but then always! uXs pointed that out already). This would work on an indefinite board, but this doubling strategy here would not! (I still might be mistaken). Perhaps I have created an SGF of my former trials and can retrieve it. JoelR: I take Bill's ladder to be the definitive answer to "what happens if Black blocks on the 4th line". But it's worth pointing out that Black has to be careful in other ways: The bamboo joint may be short of liberties. tderz: Good point indeed. This diagram shows that (as , and ) in dia (2) where mistakes, because one does not need to take liberties of a group which you would like to contain. (Because it also costs your own liberties). 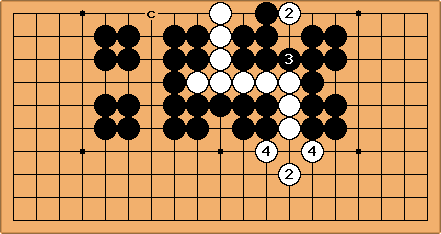 Black could be played at a (dia (2)), for the other moves, the junctions b, c and d might be more advisable as addressed above. 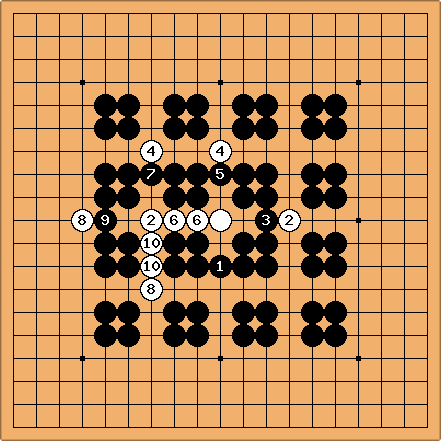 White here would also not work if Black had played his in dia. above on the place of the right . Case I: Black starts, . Contrary to the initial remark of s.o. above, it might make a difference. Systematic approach (2), moves 11-end. tderz: I display it as =tenuki, for better detection of any difference. The white numbers the remain the same (and I can copy the diagram :-) ). 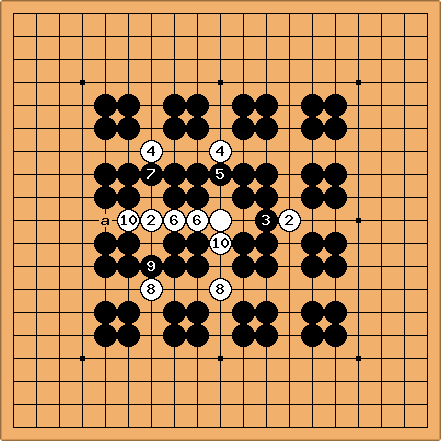 but the left in dia (3) is not placed optimal, it is not forming miai with the center stone, only for connection with the left . Playing a ladder, white can win with a-a(cf. below . Ed? : White's moves at are unnecessary, this allows black to kill with at Playing at 'b' and sets up a ladder immediately. Ed? 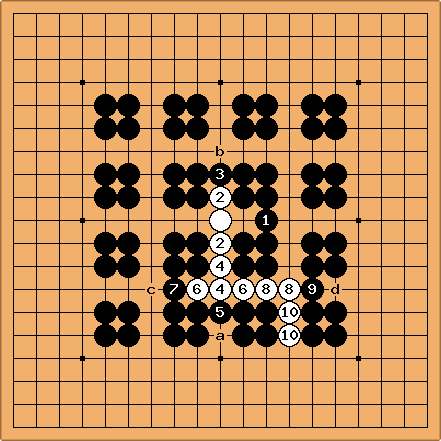 : Playing at 'a' and to the right of 'a' sets up a ladder immediately. 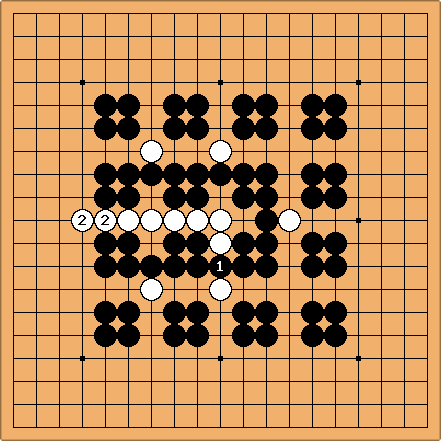 tderz: Black connects at a, White lost. If the problem is constructed in such a way that the edge is at e, White might succeed (Black could be captured). tderz:  Playing a ladder, white wins.